Read responses to e-mail questions sent in to the expedition on Peru's Mt. Sara Sara in September of 1996. Send comments about this Web site. In regard to your statement that "plundering of sacred sites continues today". Digging up a 500 year old mummy, for whatever reason, constitutes desecration of a sacred site. But, if your mission is only to substantiate the hypothesis that such mummies exists, OK, but immediately return any you find to their icy graves. If however, they are to be moved to a freezer in some museum's laboratory, for anthropological studies, would NOVA not then be equally guilty of plundering? There must be many persons who would find such actions far more distasteful than having a few gold coins stolen? Please clarify the justification of the mission. Many thanks and don't fall off the mountain. "The dead should be left alone, but the reality is that there's extensive looting of tombs and destruction of mummies in the Andes. It is inevitable that this will appear at sites where there can be no protection provided because of high altitude. True respect for the dead under these conditions is being done by careful excavation and conservation of materials. This position is accepted by local indigenous peoples and national governmental authorities. This way the dead and their possessions can be kept in one place, safely, and well preserved—at least enabling, if so desired in the future, a potential for reinterment. All of our work is done to demonstrate our respect for the traditional beliefs and customs of the indigenous people where we work. Locals have always been involved in our work. We see no alternative to this approach. But, we are open to any suggestions." How heavy are the backpacks that the team members carry? What equipment is used for communication among the team members and with the outside world? Thanks! We are able to communicate "live" on the web through the use of a satellite phone that is linked to a laptop. A digital camera is also being used, and we are able to retrieve and compress those images into small files that can be transferred via satellite. Each image takes about 3 minutes to send, whereas a page of text takes only seconds. To send an image, for example, the digital camera downloads an image into Adobe Photoshop in the laptop. The laptop then compresses the image into a .jpeg file. Then, using communications software, the laptop dials up NOVA ONLINE and transmits the image through the satellite phone. The image then travels as bits from the satellite phone on Sara Sara to the "Atlantic Ocean West" satellite which sends the bits down to an earthlink station in Canada. The information then travels by phone lines to NOVA ONLINE. On the receiving end, NOVA ONLINE has a designated computer with a designated phone number that receives all of our information from the field. It is then just a matter of minutes until the information is put up on the site. As far as our backpacks are concerned, we have a standardized requirement of 20 kilos (45 lbs) that paid porters must carry. Many of them, however, have enthusiastically carried as much as 40 kilos! Those of us who are documenting the climb and excavation carry all of our cameras, lenses, tape recorders, batteries etcetera so that we can be mobile and document events as they happen. 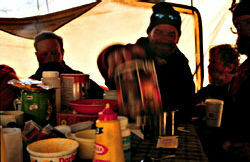 We do have some assistance for the rest of our essential expedition equipment and food. Does any of your staff speak fluent Quechan? What unexpected things have happened so far? Expedition manager Matt Wells writes: "Dios pagarata-puikimanta!" which means "We're grateful for your question about the Quechua speakers on our expedition." Yes, there are a number of expedition members who speak and are familiar with Quechua, otherwise known as Runa Simi. In particular, Quechua is the prima lingua of Zoilo and Genero, our cooks, and of Ignacio and Arcadio, two of our indispensable archeological and mountain staff. Many of you may be aware that Quechua is an ancient language spoken throughout the pre-conquest Inca empire. The language was a major factor in the unification of many tribal and cultural groups within the extensive land regions administrated by the central Inca government in Cuzco. Originally, Quechua was an unwritten language and has only recently been phoneticized for study and instruction. As with any unstandardized form of communication, change in evolution occurs over a period of time, and today the Quechua which is spoken in the Andean highlands is regionalized to the point of being distinctly different from one area to the next. There is a continuity of nouns and verbs, however, that are recognized in most regions. For example, all those that speak Quechua count in the same manner and recognize words such as water, sun, moon, man, woman, child, and home. For a major percentage of the indigenous population, Quechua remains the first language. Spanish, however, is the official governmental and commercial means of communication in Peru. Nonetheless, Quechua unites the highland communities and continues to remind them of their cultural heritage and their living past. To answer your question about unexpected things, once you leave a population center in Peru, everything is a gamble. You have to rely on weather and uncertain conditions. Things mechanical always seem to break down and the availability of materials (food and supplies) is not always at your fingertips. This is the challenge of any expedition. My son-in-law and I want to know if in the Inca society, which apparently used ritual sacrifice to appease an all-powerful mountain/sun deity, did this society at the same time have shaman healers? The latter understand and practise a balance in nature which appears in contradiction to a sacrificial, (mono? )theistic society. What type of problem would provoke a human sacrifice? P.S.—the site is terrific and we enthusiastically follow your every step! Did the Inca have Shamans? Yes. Johan Reinhard defines a shaman as "A person who at will can enter into a non-ordinary psychic state in order to communicate with the spirit world (either through spirit possession or soul journey) on behalf of the community." We know that shamans existed in Inca culture because the Inca talked about some of their people having "spirit possession." Shamans, furthermore, probably participated in the human sacrifices but we don't have any specific reference to this in the early chronicles. We know, however, that "priests" were integral to the process. Sacrifices were often made during or after an auspicious event: an earthquake, an epidemic, a drought, or after the death of an Inca Emperor. We will present more about the Capacocha sacrificial ceremony in the "Lost Worlds" article "The Sacrificial Ceremony" beginning Saturday, September 21st. It's incredibly fascinating to live out the real-life heroes whose passion is to uncover the hidden wonders of the ancients, while we sit back in our comfortable homes and watch, and eerily feel their anticipation for the next steps that carry them on to their journey. My heartbeat was slightly racing as I read what awaited them to their goal. I hope that those people who gave themselves up for sacrifice so long ago, could secretly have wished that one day others would come to find out about them and their ordeal, forever immortalizing them. I eagerly anticipate the final documentary, and thank PBS for this close-to-real life experience. My fifth grade class and I are thrilled to find this site about Incan Indians. We have just finished studying the early Indians of North and South America. This site will enrich my students well beyond any material that I can supply. We will follow the expedition carefully and eagerly! Thank you for all your efforts! Hola, we were all wondering what kind of food you eat up there, and if there is any difficulty in the altitude of cooking. The food we eat at 18,000 feet usually has to be simple and easy to make. Soups are always the first course every night, and the second course usually consists of rice or pasta with mutton or vegetables on top. Breakfast is pretty traditional: eggs when they can be brought in from the village below, pancakes, and hot oats. Lunch is bread, cheese, chocolate, a piece of fruit and sometimes nuts. At altitude, water boils at a lower temperature, because of reduced atmospheric pressure; therefore everything takes longer to cook. For example, to cook a soft boiled egg at sea level takes about 4 minutes; at 18,000 feet it takes 10 minutes or longer (depending on how runny you like your yolk!). Could we get a picture of the villagers? Are they OK with you removing the mummy from their sacred mountain? The townspeople of Quilcata are supportive of the expedition and the excavation of the mummy from Sara Sara. To them, the presence of the mummy is confirmation that this mountain was very sacred to their ancestors. They came up with the name "Sarita" for the mummy, and were actively involved in the entire project. They are very proud of their town and its proximity to this very important peak. Johan and Jose Antonio's relations with the local people will continue, as they hope to return to Sara Sara to further explore the sacrificial platforms on the summit in the years to come. I would like to know more about the idea behind the children being offered as sacrifices. Why not virgins, as in other cultures, or the "Holy Men" themselves? If you haven't read "The Sacrificial Ceremony", please do—it describes the sacrificial ritual in some detail. As far as we know, the children were virgins, although that was not known to be a prerequisite to sacrifice. Historians believe the children, in their perfection, were perhaps the most valuable humans for the culture to sacrifice. They were chosen by their own families, and it was considered a great honour not only for the child but for the family as well. I am curious about how well the team is adapting to the high altitude at the summit of Sara Sara. In particular, are team members recovering from the effects of high altitude sickness with time spent at 18,000 feet? Are the local team members recovering faster than the "lowland" (and North American) team members? We address this question in this week's feature, "The Mummy's Journey." As to the local team members (i.e. those from Quilcata) they seem to be unaffected by the altitude. Quilcata sits at 11,000 feet. This surely gives the people from the village an advantage in acclimatizing quickly to 18,000 feet. The archaeologists from Arequipa—Johan and Jose Antonio—were also quick to acclimatize because they have spent the last few months at altitude excavating on Andean peaks like Pichu Pichu and Hualca Hualca. What's the weather like in Peru? The weather (at least on Sara Sara) is generally dry, except for the occasional snowfall and storms we got at 18,000 feet. During the day, when the sun shines, it is warm, but as soon as the sun drops below the horizon it becomes very cold. My class is studying Peru. And we would like to know was the tomb found underground? or above ground? The tomb was underground in a "platform" on a southeast facing slope on Sara Sara's summit. A platform is typically a rock enclosure built from rocks ranging from the size of a football to the size of a large computer monitor.